Good News!!! UP 68500 Assistant Teacher Recruitment 2018 Notification released. Candidates who qualify TET exam are only eligible to apply for this latest Assistant Teacher Vacancy in UP. Further details like District wise Vacancy, Eligibility, Uttar Pradesh Shiksha Sahayak Exam date, How to Apply, etc. are disclosed in detail below. Hence read the complete article to know more about UP Basic Education Board Teacher Recruitment 2018. UP Basic Education Board Latest News: The Government of Uttar Pradesh is taking a great initiative to hire the skilled and talented contenders for the Assistant Teacher posts in Basic Primary schools. As per the latest information, UP Assistant Teacher Recruitment 2018 Notification is going to be released on 23.01.2018. There is a total of 68,500 posts available in various districts of the state. This is the great opportunity for all the candidates looking for Teaching Jobs in Uttar Pradesh. Hence all the Interested candidates can apply for these 68, 500 उत्तर प्रदेश बेसिक शिक्षा परिषद नौकरियों through online mode by following the steps provided on this page. Coming to the eligibility, aspirants must have done BTC/ D.Ed from a recognized University of the state. For the sake of candidates like you, we are also providing the apply online link to UP Assistant Teacher Jobs at the bottom of this page. The commencement of Online applications opens on 25th January 2018 and closes on 9th February 2018. Since there is a huge number of vacancies available there will be massive competition and heavy rush on the server. So, we suggest that apply as soon as possible to avoid last minute server issues. Hence, hurry up guys be ready to apply for Latest Teacher Jobs in UP. These 68500 Sahayak Adhyapak jobs in Uttar Pradesh are to be filled in Basic Primary schools of various districts. Compared to the number of posts, there are more vacancies present in Sitapur district and more than 24 districts have above 1000 vacancies available. Since there are a huge number of vacancies, the competition will be high. So, in order to compete thousands of applicants, you should work hard. But don’t worry; we are here to help you to crack the Uttar Pradesh Assistant Teacher Bharti 2018. 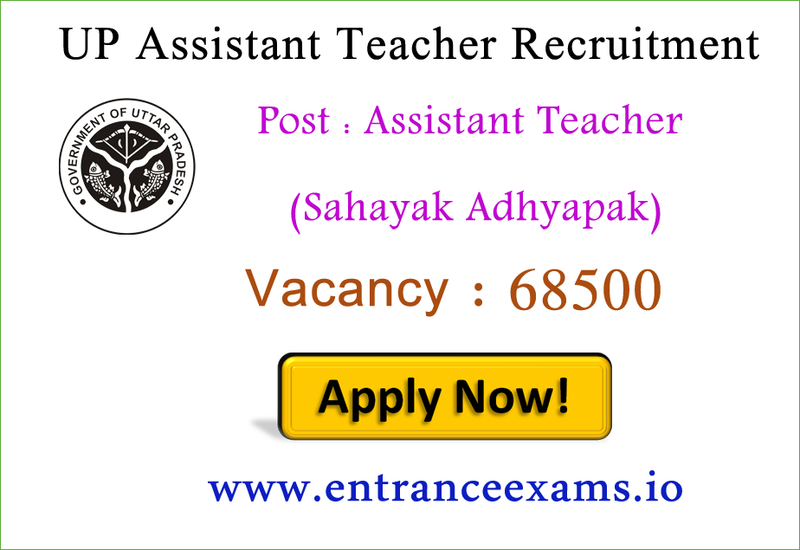 To know the district wise Assistant Teacher Vacancy in UP state, refer the below link. Applicants for UP Asst Teacher Recruitment 2018 should satisfy the eligibility conditions mentioned in the official notification. The age limit and educational qualification required for 68500 UP Basic Education Board gov in Jobs are as follows. The minimum age of the individuals applying for this Upcoming Teacher Vacancy in UP must be 21 years as on the last date of application. Whereas the maximum age limit will be intimated later. However, candidates will get age relaxation as per the rules of the government but for reserved categories only. Candidates who are going to apply for UP 68500 Assistant Teacher Recruitment 2018 must possess graduation Degree, i.e., BTC/ D.ed in relevant field from a recognized institute or university. The most important thing is you must have achieved at least 40% marks in the graduation to get eligible for UP Basic Education Board Teacher Recruitment 2018. Moreover, those who qualify the Teacher Eligibility Test (TET) 2018 are only eligible. Before applying for UP Asst Teacher Recruitment 2018, one should be aware of some details such as Selection Process, Pay Scale, Important dates, Application fee, etc. So, let’s have a look at them below. The officials will select the candidates of UP Assistant Teacher Bharti 2018 based on their performance in screening the application form and marks scored in TET (Teacher Eligibility Test) 2018. All the selected candidates will receive a salary best in the industry along with the perks and allowances. Visit the official website, i.e., www.upbasiceducationboard.in or direct link available below. Click the UP Sahayak Adhyapak Notification 2018 link. Read the notification completely before applying. Now navigate to Apply online link to UP Basic Education Board Teacher Jobs. Fill the online application for UP Assistant Teacher Recruitment 2018 with correct details. Verify the details once and click on submit button. The officials of Uttar Pradesh Basic Education Board has not yet released the notification for UP Asst Teacher Jobs. Whenever the officials release the UP Assistant Teacher Notification 2018, we will update the same on this page. So, keep visiting this page for more details. Bookmark our entranceexams.io site for instant updates. please provide me previous year question paper for assistant teacher or give idea about boos..